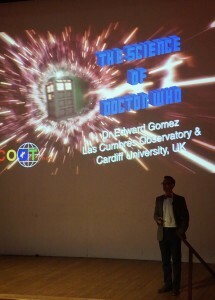 Last week, Cardiff University partnered with the Institute of Physics in Wales and the National Museum to deliver their first “Science Of” Lecture based on the hit TV show Doctor Who. 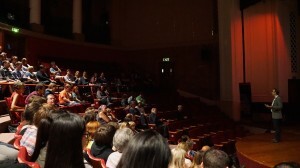 More than 250 people went to the Museum on Friday evening to hear Dr Edward Gomez from the School of Physics and Astronomy. During his talk, Dr Gomez discussed what we currently know about the several thousand alien worlds (exoplanets) we’ve discovered in the last 20 years and if any of the worlds the Doctor has travelled to are similar to those recently discovered by astronomers. He also talked about time travel and the possibility that we might one day be able to do this and what the time vortex may be made out of. Prizes were also awarded for the best fancy dress. An entire family of Doctor Who monsters including The Silence and a Cyberman, and a weeping angel went home with games kindly contributed by Rules of Play in Cardiff. Many people dressed as the Doctor themselves, with David Tennant look-a-likes popular on the night.